How Many Rivers Are There In Pakistan? Home / Geography Of Pakistan / How Many Rivers Are There In Pakistan? Question: How Many Rivers Are There In Pakistan? 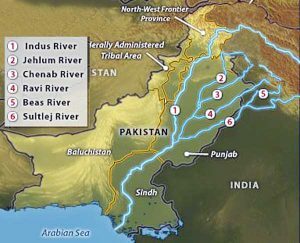 After the detailed research, it is identified answer of the question All Rivers in Pakistan. The answer is there are 28 rivers in pakistan listed above. Searching for How Many Rivers Are There In Pakistan? Read out this entire page and get the list of Rivers in Pakistan governed by the Government of Pakistan. Undoubtedly Pakistan is one of the blessed countries with rivers. These rivers usually originate from the snow-covered Himalayan and Karakorum Range. Rivers play a vital role in any country due to irrigation property. It directly grooms up the agriculture of a country. Rivers are the best source of irrigation and provide needed water to the crops. Indus River is taken to be one of the longest rivers in Asia. This river has been originating from Tibetan Plateau and has been running into the course all through the Ladakh region of the Jammu and Kashmir. This is the national river of Pakistan. This river has the total drainage area that is exceeding around 1,165,000 km2 (450,000 sq mi). Sutlej is named to be the easternmost tributary in the Indus River. This river has the Sanskrit name that is Shatadru. This river has the main origin that is Rakshastal Lake In The Place Of Tibet. The total length of Sutlej is estimated out to be around 1500 Km. This makes it turn out to be the longest river of Punjab. It is an interesting fact to know that the Vedic name of Ravi is Purushini. It has the name of Iravati in the Sanskrit. This river has been rising from the Kangra district over the side of Himachal Pradesh and makes its way into Punjab in the place of Pathankot district. This river has been flowing all along with the international border over the place of India and Pakistan. It does flow at the total length of around 720 Km. This river is also known by the name of Askani in Vedas and in Sanskrit, it is known by the name of Chandra Bhaga. This river normally starts from the way of the Himalayas in the region of Lahaul and in the Spiti district over the place of Himachal Pradesh. The total length of this river is around 960 Km. Last we have the Jhelum river! Its Vedic and Sanskrit name is Vitasta. This river has been originating from the Verinag. This river most of them all flows all by means of Jammu and Kashmir and then it makes its way into the entrance of Punjab. It has the length of around 725 Km. Yet the answer of your question about how many rivers are there in Pakistan? is discussed on this page.